Born into a musical family in Hochfield, Manitoba in 1932, Ed Bickert's family moved to Vernon, British Columbia, where he grew up. His interest in playing the guitar began early in his life and he was mainly self-taught. When he was 19, Ed moved to Toronto and gradually became part of the jazz scene there. He already had a unique sound, wam and swinging, with subtle and rich harmonies, and it wasn't long before other musician took note of his vast talent. During the 1960s and 1970s he was in great demand, working with major figures of Canadian jazz as well as top American musicians. Ed Bickert has been a major influence not only on Canadian jazz guitarists, but also on musicians throughout the world. He is a multuple Juno Award-winner who was appointed to the Order of Canada in 1997. We are privileged to present Ed Bickert with the very first Canadian Jazz Master Award, in recognition of his lifetime of artistic excellence in jazz. 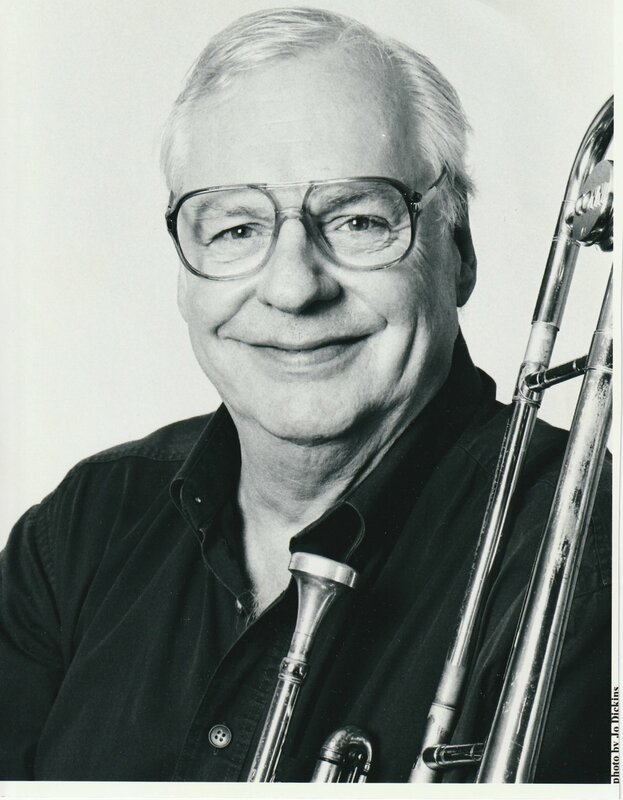 Valve trombonist, bandleader, composer, arranger, and music educator Rob McConnell was born on Valentine's Day, 1935 in London, Ontario. The son of a travelling salesman, he grew up in Toronto. McConnell took up the valve trombone while in high school. His professional career began in Edmonton in the early 1950s when he joined Don Thompson's big band. McConnell also became an in-demand session musician. McConnell performed with Phil Nimmons' group "Nimmons 'N Nine" before forming his own big band, The Boss Brass, in 1968. With membership that included Ed Bickert and Moe Koffman, The Boss Brass became his primary performing and recording group for more than thirty years. Rob was an extremely talented arranger, a lyrical trombonist and a bandleader with a reputation for perfection and artistic excellence. Rob McConnell and the Boss Brass earned many awards and honours through the years, including 17 GRAMMY nominations, 3 GRAMMY wins and four Juno Awards. Rob was inducted into the Canadian Music Hall of Fame in 1996. He was named an Officer of the Order of Canada in 1998. Rob McConnell passed away on May 1, 2010 at the age of 75. We are honoured that he is the recipient of the first posthumous Canadian Jazz Master Award for a lifetime of artistic excellence. Oscar Peterson was one of the world's greatest piano virtuosos. As a performer, recording artist, composer and mentor, he inspired audiences and musicians everywhere. His place of honour in the international jazz pantheon is universally recognised. Oscar Peterson was born on August 15, 1925 in the Montreal working class neighbourhood of Little Burgundy. Oscar was the fourth of five children born to his parents, Daniel and Olivia Peterson, who were immigrants from the British West Indies and Virgin Islands. Oscar's enormous musical talent, evident early in his life, was encouraged by his parents. His performance career began while he was still in high school, ad the pianist with the Johnny Holmes Orchestra. A few years later he formed his own trio and his fame grew quickly. His appearances at the Alberta Lounge in Montreal were broadcast live on the radio. In 1949, impresario Norman Granz heard one of those broadcasts, went to the Alberta Lounge and enticed Peterson into making a surprise guest appearance with Granz's all-star "Jazz at the Philharmonic" at Carnegie Hall later that year. The rest is history. A Companion of the Order of Canada and recipient of the Governor General's Performing Arts Award for Lifetime Artistic Achievement, he received many important distinctions, awards and honorary degrees.